It was a successful event for the upcoming brand, with Reena Bayley, Marketing Manager, telling Maritime Journal: “The show has been a real success for us this year. We saw a wide variety of boat operators and are delighted with the response we received. This year we had a bigger stand, giving us a better profile at the show. Having the full-size model of our engine on the stand has certainly helped to boost interest. Cox has brought together highly skilled engineers from Formula 1 racing and premium automotive engine design to develop this completely new concept diesel engine, providing, it claims, gasoline outboard performance, with diesel economy and reliability. 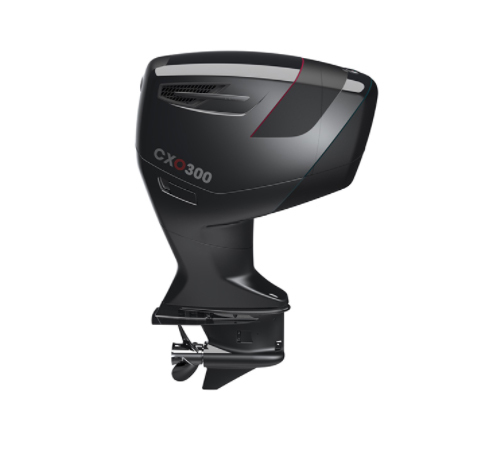 Cox displayed a full sized model of the CXO300, which is a revolutionary opposed-piston, diesel outboard designed specifically for professional marine users. Delivering 300hp and weighing only 300kg, it is designed for commercial and government applications, where performance, durability, and fuel efficiency are paramount. Cox is a British company based in West Sussex, dedicated to answering the demands of commercial and government marine operators, for a reliable and powerful diesel outboard. With petrol now not permitted on board many commercial vessels and superyachts, the development of a viable diesel outboard for RIBs and tenders, offering the comparable power and weight of a gasoline engine, has been an important factor in the rapid expansion of Cox Powertrain, along with other companies rapidly developing competitor products.